Saving money on energy costs is the biggest reason most companies decide to insulate their HVAC systems. Chances are good that you don’t spend much time thinking about your HVAC system unless it feels like your energy costs are drowning you. Either way, investing in insulation for your commercial HVAC system is a great way to help reduce those costs and improve the efficiency of the system as a whole, so you can get back to not having to think about it. Here are four benefits of insulating your commercial HVAC system. Saving money on energy costs is the biggest reason most companies decide to insulate their HVAC systems. While there is an initial cost to adding the insulation, that cost is usually balanced out by savings within two years. 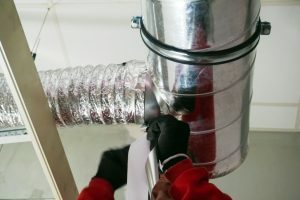 This is because the insulation, which is primarily around the duct work, helps keep more of the conditioned air inside the ducts and traveling to the areas of the building where you need it, rather than escaping through leaks. The insulation also reduces the temperature difference between the outside of the ducts and the inside, so the air doesn’t lose heat (or warm up) on its way to your work areas. When ducts are not insulated, you usually use more energy to get the rooms to the proper temperatures, because the air is cooling or warming on its way there through the ducts. Insulating the ducts so that there is less change in air temperature is not just about saving money; it is also about regulating tenant comfort. When you have your HVAC unit set to 70 degrees, but the air that reaches the far end of the building is 75 degrees, your building occupants suffer. Many studies show that employee productivity improves with consistent, comfortable temperatures, and insulating your HVAC ducts can help achieve that. All of these factors that save you money will also help put less stress on the HVAC system by lightening the load it has to carry. When you do this, you increase the life of your system, which is a big win. Over time, you will find that you have to do fewer repairs, replace fewer parts, and get more years out of your system because you’re putting far less stress on it. Once you decrease your energy consumption by insulating your HVAC system, you will be helping to decrease the environmental impact of your business. This is often very important to customers, but it also sometimes pays off in tax incentives and helps with regulatory compliance measures. This entry was posted on Tuesday, March 26th, 2019	at 1:33 pm	and is filed under Commercial HVAC Systems . You can follow any responses to this entry through the RSS 2.0 feed. Both comments and pings are currently closed.